Baby has a whole world to discover! The mouse, frog and bunny play in the cheerfully colorful Dream city, while an abundance of play elements such as squeaker, crackling and reflecting foils entertain baby and stimulate their senses. Folding up the sides, equipped with loop and hook attachments turns the play surface into a small bed or changing surface. A clutching toy or clacking figure can be easily affixed to the detachable play arch. Measures 47.5" x 41.5". Perfect for babies from birth on up. Soft cotton poyester blend. Measures 47.5" x 41.5" (flattened out). Made of cotton, polyester, plastic. Suitable for babies from birth on up. The Whimsy City Play Gym features a whole world to discover! The mouse, frog and bunny play in the cheerfully colorful Dream city. an abundance of play elements such as squeaker, crackling and reflecting foils entertain baby and stimulate his senses. 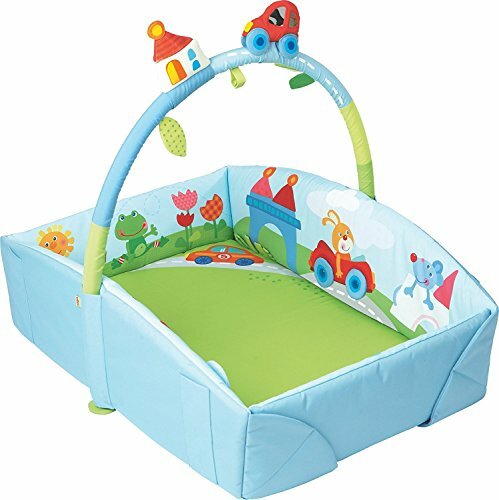 Equipped with loop and hook attachments this soft cotton/polyester play mat transforms from a flat play surface into a small bed or changing area. A clutching toy or dangling figure (sold separately) can be easily affixed to the detachable play arch.